Every year when we leave the dock we begin a transition from the pace of our regular lives to the rhythms of sea. It takes a few days and usually some “issues” to focus on why we are here on this journey north. 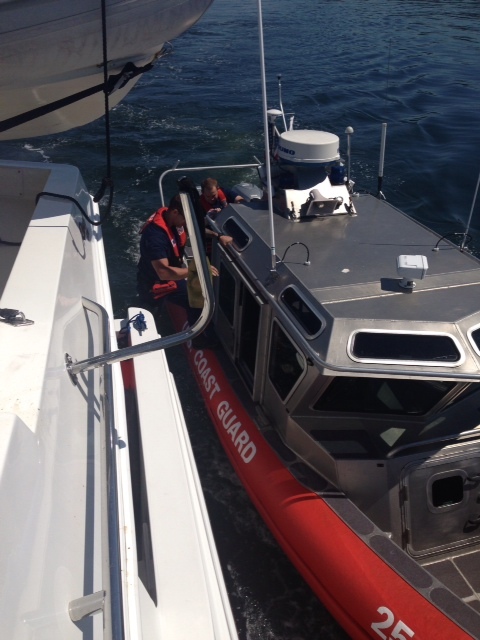 Friday afternoon as we were leaving the states we were boarded by the US Coast Guard for a safety inspection. This happened to us once before on our very first journey out of the marina on our first boat. The men on the boat were friendly (clearly just learning this procedure) and we went through each item on their check list. It turns out we are very safe and up to code including extra fire extinguishers but, we did not have a written “waste management plan”. That is correct. We did not have a piece of paper on board that explains our plan for our garbage. We would like it on the record that we always put our garbage in our trash and recycle bins and when we go ashore we transfer this stuff to the big bins on shore. The Captain takes full responsibility for this enterprise. We do not throw our garbage overboard, ever. This is a solemn promise. However, because we did not have it in writing we were “cited” but not fined. We know the Coast Guardsmen didn’t make these rules and they realized this was a silly request. But the bureaucrats that made this rule clearly do not have enough to do and are overpaid. The Coast Guardsmen left the True Love practicing a moving transfer to their boat while Jim and I both took photos and videos like proud parents. We then headed up to Canadian waters taking our time on a beautiful afternoon. 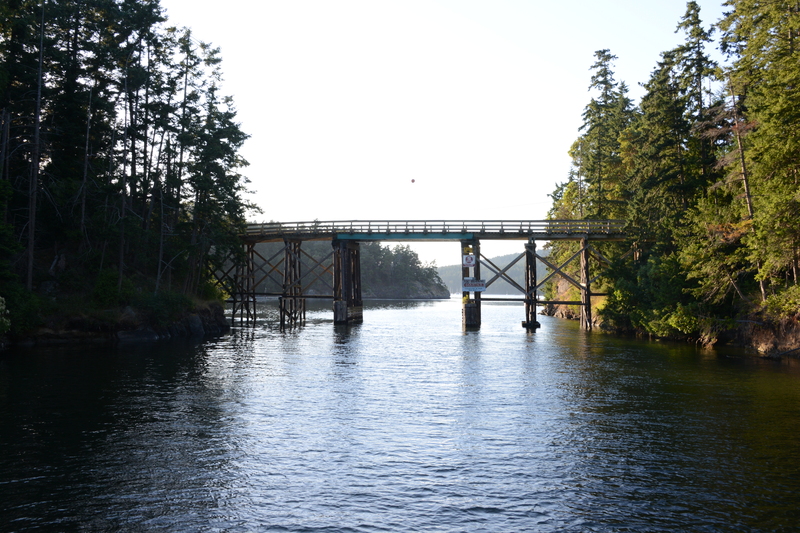 Customs was easy and we headed through the Pender Island channel to anchor for the night in Port Browning Bay. This was a first for us. It a sweet little bay on just north of Pender Harbour that’s perfect for overnighting with easy anchorage . We settled in, I made some yummy quesadillas with left over grilled vegetables. We experienced the good food, Sade playing on the Ipod, the sunset and a peaceful end to a successful day. 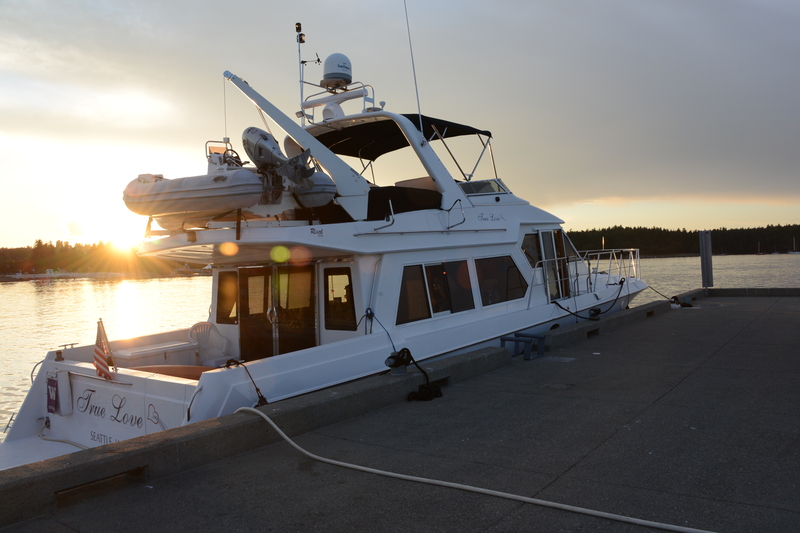 I always look forward to the cruise up the Southern Gulf Islands. The weather is usually calm and the views beautiful. When we lifted the anchor we had a bit of a problem with water control on the bow of the boat where we use a hose to wash off the mud and seawater on the anchor and its chain as we bring both back up. The bit of a problem was that the handle just came off. So the Captain turned off the water pressure and we proceeded to our next stop with the hope of finding a fix. 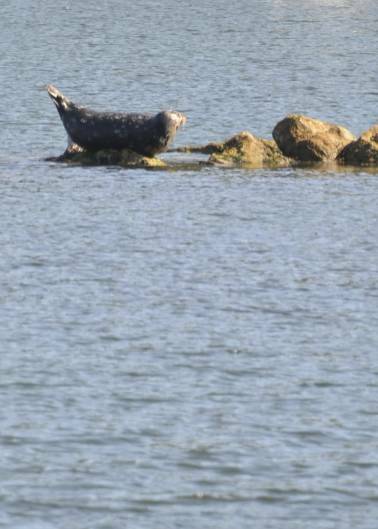 Although the sun was bright and warm and the tide was with us we did have a pretty stiff northwest wind. Both Jim and I did our exercises on the stair stepper, sit-ups, push-ups and stretches. We couldn’t get a dockside reservation in Nanaimo so we decided to head to another first stop for us: Silva Bay on the southeast side of Gabriola Island. By the time we got there we had some serious winds. Docking was a real challenge as the gusts increased to over 25 knots. But the Captain did a fantastic job and with help of the people on the dock we got ourselves into our slip and prepared to relax again for the night. Silva Bay is a charming little place with a wonderful waterfront restaurant, pretty views and nice people. We settled, plugged in the power and then headed to shore to see if we could repair our water faucet. We were directed to Vince. Vince is a sweet, if somewhat rough handyman for the marina. I showed him the faucet top and he proceeded to take it apart using only his box cutter. It really was a thing of beauty. I love this part of being on the True Love. Not the breaking of things of course, but the fixing. It seems that society has in so many ways devalued the everyday problem-solving skills and personal responsibility skills needed in life, especially in a times of crisis. The little things that inevitably break while boating in remote areas hones these skills. With the faucet fixed and our water pressure on, we showered and headed in for a yummy liner at the café. It’s almost impossible to find this kind of sweet little outdoor restaurant in the Seattle area. All the outdoor patios are too big or too busy. I love this part of our trip . . . the sun, the good food, the views, the quiet. We did some chores at the dock before heading back to the restaurant for some late dessert and sunset. Our plan was to leave at dawn and hopefully catch the typically lower early morning winds to cross the most difficult waters on our trip: the Strait of Georgia. 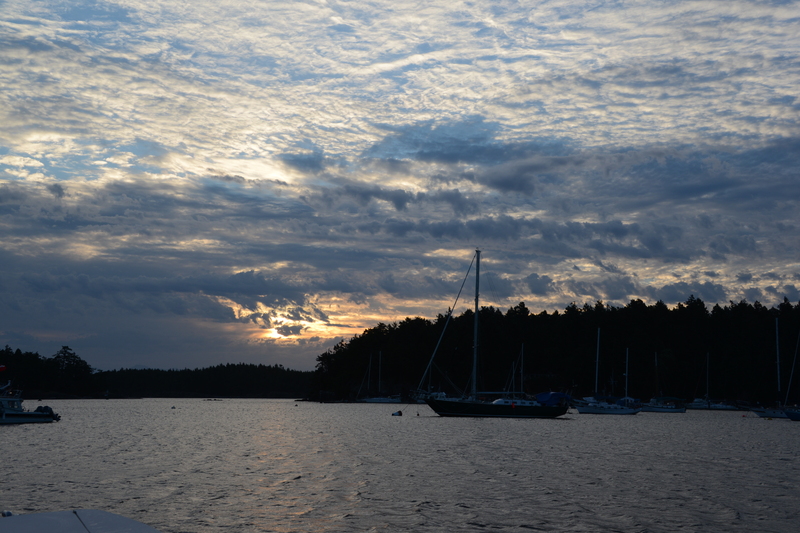 We woke at 5:30 to a beautiful sunrise and leaving the dock was a breeze. As we turned north into the Strait we encountered very strong winds and 3 – 6 ft seas. It wasn’t smooth, but we felt we could make the bouncy 3-hour crossing until we got an alarm and warning lights from our inverter panel. Our inverter changes DC battery power to AC when the generator isn’t running. Now this was new and not something we wanted to deal with in these conditions, which were not fun at all. We turned off all the AC power and turned around and headed back to Silva Bay. Again the strong winds made docking a challenge, but with the help of dock mates we were pack in port. We discovered one of our bedroom portals had leaked from the strong waves and water got on an old phone charging plug which had done a self destruct sequence and ruined the outlet. So, our new rule in crossing open water . . . no plugs in the sockets especially near portals! After chilling a bit we headed to enjoy the omelet bar on the deck of the restaurant, process our unsuccessful crossing, call our boat guru Ben Rhoades for advice on the next step to repair the outlet and make new plans. 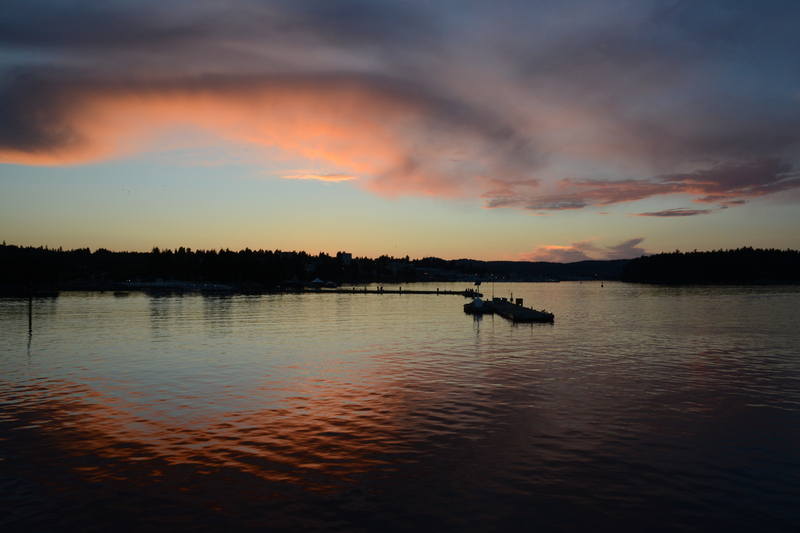 We headed to Nanaimo where we settled, refilled our water, plugged in and headed to our favorite Greek Restaurant where we ate well and drank Ouzo enthusiastically. Sunday felt like two days, but we were rewarded with a stunning sunset. Today we did laundry, grocery shopping, purchased our needed supplies to repair the outlet and our water pressure valve. We are currently enjoying frappuccinos and Starbucks free internet. For dinner we will enjoy leftovers from last nights yummy dinner while we make our final preparations for our Strait of Georgia crossing Tuesday morning. The predictions for wind are lower, but if they aren’t we will adapt and enjoy more of what Nanaimo has to offer. We’ve decided the melting plug was a sign to unplug from our regular lives and enjoy our vacation. So other than some quick check-ins and writing our blog we are now officially on vacation. You must love maintenance to sail a boat. Nice, Fawn, look forward to hearing more!